This article is part of a chronological series, intended to be read in order. So if you ain’t here because you have read the previous part, you want information about this sequencing. The New Mutants – Year one, part #1. 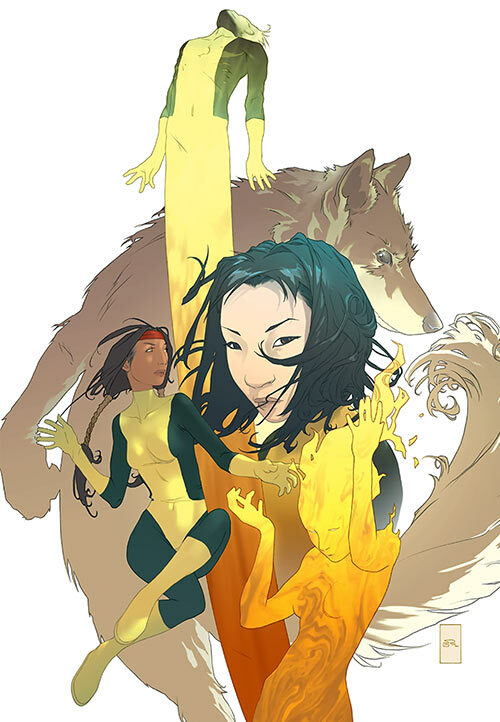 The New Mutants – Year one, part #2. The New Mutants – The rest of the 1980s. This starts *right* where the previous article ended! She launched her expedition. Roberto and the New Mutants rode along. Emmanuel da Costa planted an inside man to sabotage the expedition. This man, Castro, arranged for the boat carrying the expedition along the river to crash. 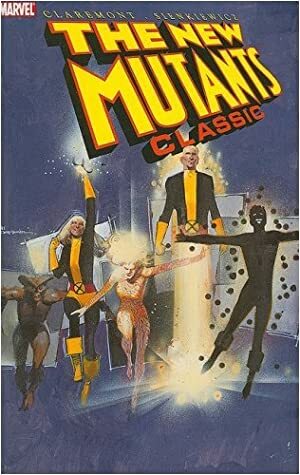 The New Mutants survived and made their way safely to shore, only to be taken into custody by Legionnaires from a legendary ancient Roman settlement: Nova Roma. There, they met Amara Juliana Olivia Aguila and her father, Lucius Antonius Aguila, First Senator of Nova Roma. Amara was a mutant with powers related to earth and lava, but her powers were only just manifesting. The New Mutants also met Senator Marcus Domitius Gallio, master of the City Guard, who hoped to become Nova Roma’s first emperor. He allied with Castro, the Hellfire Club’s man. Gallio made himself a patron of the New Mutants, hoping to use their powers to bring down Senator Aquilla. The Mutants helped prevent his coup. Then they, with Amara, fought his evil, super-powered wife. For years, this woman preyed on Nova Roma’s population, for she was Selene, an ancient sorceress and psychic vampire. She was also a mutant, and her encounter with others of her own kind led her to go back to the outside world. She would soon be seen in New York. This exposure to the outside world brought new perspectives to the ancient city. Senator Aguila considered potential trade partnerships. And when the New Mutants invited Amara to go back with them to Xavier’s School, he also saw the value in having his daughter become familiar with the foreigners’ ways. Amara joined Xavier’s school using the codename Magma. It took time for her to adjust to modern ways and to harness her powerful abilities. Back in Salem Center, the mutant teleporting powers of Illyana Rasputin, Colossus’ sister and Kitty Pryde’s roommate, were finally revealed. She still kept secret much of what had happened to her in Belasco’s Limbo, but Illyana would become the next New Mutant. Kitty Pride, still in high school, worked on computer projects with a local student, Doug Ramsey. He was a geek and computer genius, just like her. They became close – much to Colossus’ dismay, who saw him as unfair competition for Kitty’s heart. When Doug received a scholarship to the exclusive Massachusetts Academy, he asked Kitty to visit the school with him since she briefly went there. Kitty freaked out. This school was run by Emma Frost, White Queen of the Hellfire Club. Kitty told Xavier and the X-Men the situation. Xavier shocked her by revealing that Doug was a mutant with the power to comprehend languages, both human and computer. Xavier considered it a “quiet” power, not so dangerous to control. So he had decided to leave Doug out of his school. But he speculated that the Hellfire Club might be interested in his power. Emma Frost was supposed to be in a coma after her last encounter with the X-Men, so Xavier agreed to let Kitty accompany Doug to Boston. The X-Men were standing ready to provide backup if the need arose. Unfortunately, that’s when the Beyonder decided to play his “Secret Wars” game. The X-Men were abducted to his Battleworld. And when Doug and Kitty boarded the private plane sent by the Academy to fly them to Massachusetts, they encountered a fully recovered Emma Frost. When Kitty reached out to telepathically cry for Xavier and the X-Men’s help, there was no response. She was on her own. 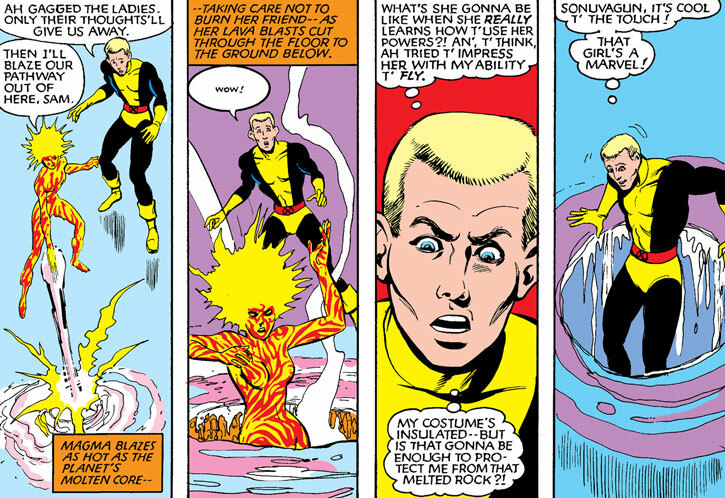 However, her roommate Illyana was also a powerful sorceress – even though the New Mutants didn’t know that yet. She became worried at not hearing any news from Kitty. She sent her astral form to scout the Massachusetts Academy. Illyana soon discovered Kitty was held prisoner while Doug was occupied elsewhere. Frost’s telepathy kept him from noticing anything amiss. The White Queen’s powerful mental abilities also allowed her to sense Illyana’s presence and dispel her astral form. The shock was so intense that Illyana screamed, losing control and unleashing demons from Limbo . 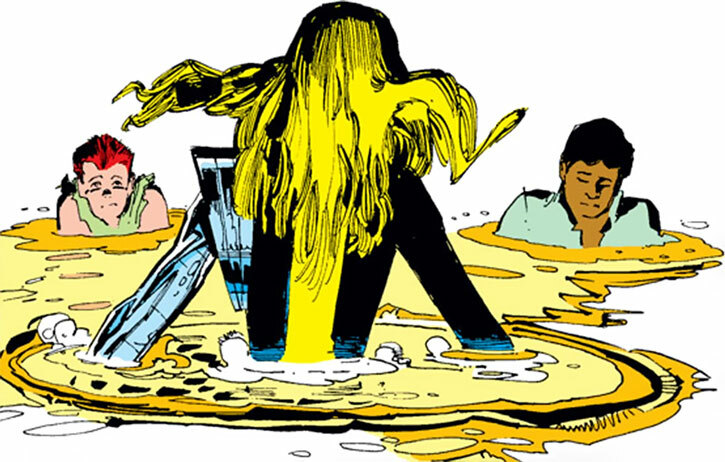 The New Mutants helped her, but they had now witnessed the extent of her corruption by Belasco’s Limbo. Recovering, Illyana convinced them to go to Kitty’s rescue. Not confident enough in her teleporting ability to transport the entire group, they reached Snow Valley by bus and hoped to sneak their way in and out. Things turned sour when Emma Frost revealed her own teenage mutant team: the Hellions. 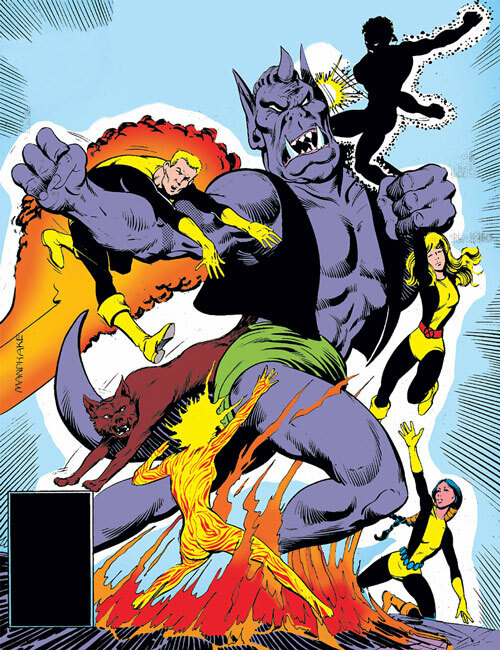 Fighting on their home ground, backed by the Hellfire Club’s hardware and personnel and its White Queen, the Hellions captured the New Mutants. Illyana managed to retreat with Dani through a long range teleportation disc to Limbo. There Dani encountered S’ym and his fellow demons, giving her a glimpse of what Illyana’s childhood growing up with demons had been like. The experience helped the two to become close. Illyana and Dani went back to Snow Valley to rescue the others, but Illyana’s limited control of her stepping disks caused a mishap. They appeared one year in the future. They were horrified to see what had become of Kitty and the New Mutants. They had been incorporated into the Hellions and acted as if the other Hellions were the best of friends. 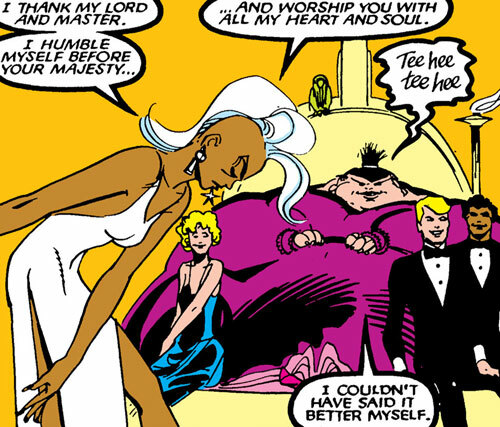 Emma Frost had brainwashed them. Illyana tried to get them back to their own time. But the closest she could get was a week after the New Mutants were captured. Illyana and Dani tried to sneak the New Mutants and Kitty out of the dormitory. The Hellions surprised them. Instead of fighting, Jetstream explained that he and his comrades joined by choice. Some of them didn’t like the New Mutants being forced to join. He proposed a duel between two challengers. If the New Mutants won, they would be free. Otherwise, they were to stay willingly. Cannonball won. However, the White Queen and the Black King arrived at that moment. They didn’t let the Hellions’ unsanctioned decision stand. A fight broke out between the New Mutants and the two adults. The Hellions hesitated to join the battle, and Catseye even helped them to escape through another of Illyana’s teleport discs. Kitty and the New Mutants were safe back at the mansion. The X-Men would soon return to Earth as well. Illyana joined the ranks of the New Mutants as Magik. Danielle Moonstar’s unusual Cheyenne upbringing made her close to the World of spirits. Her grandfather had been a Cheyenne medicine man. Her nights were haunted by nightmares about the Demon Bear who killed her parents. But it was much more than nightmares. The nightmares were warnings that the Bear was coming for her. She faced the Bear alone and was badly mauled and left for dead. Miraculously, she survived but was in surgery for hours. The Demon Bear attacked the hospital seeking again to kill her while she was vulnerable. But Sam and Illyana had deduced that Dani’s stories of her demon bear were true, and they led the New Mutants to fight the Bear. They won and freed her parents. They were not dead but had been trapped and transformed by the Demon Bear – or the mysterious force behind it. Two bystanders were involved in the process: Sharon Friedlander, a nurse from the hospital, and Tom Corsi, a local cop investigating the mauling. The great Demon Bear transformed them from normal humans into demonically powered beings under its control, using them to battle the New Mutants. Magik was able to break the Bear’s control and restore their humanity. However, they were changed. They now appeared to be Native Americans instead of Caucasians. Their reshaped bodies were also enhanced, with near peak human strength and stamina. Xavier consulted with both Dr. Stephen Strange and Dr. Moira MacTaggert, but they were not able to reverse the transformation. Moira gave them shelter on Muir Island for a time while they adjusted. In a galaxy far, far away… an alien child came to realize he must flee to survive. He was from a breed where one has to kill his sire in order to live. Otherwise, his father would kill him. Warlock’s flight brought him to Earth, where he crashed near the X-Mansion. His father was Magus, ruler of the Technarchy, a species of techno-organic aliens. Magus pursued Warlock. Their intergalactic path passed the Starjammers and Binary, then went through Magneto’s Asteroid M.
Magneto survived the atmospheric re-entry but crashed down in the mid-Atlantic. Badly injured, he was rescued and nursed back to health by Aleytys Forrester, a friend of the X-Men. Lee Forrester’s help, and their mutual attraction, took Magneto another step down the path of redemption. Magneto had already begun to soften toward humans and to question his methods of fighting for mutants. Soon he would join the ranks of the X-Men. Meanwhile Warlock made contact with the New Mutants. Unable to communicate with him, they reached out to Doug Ramsey and his mutant power with languages. Despite the shock of the revelation that he was a mutant, he managed to establish a link with the alien. The New Mutants now got the alien’s whole story. Xavier met the newcomer. He welcomed Warlock among his young students. Xavier also welcomed Doug Ramsey, who became a New Mutant with the codename Cypher. The link between Doug and Warlock would endure and strengthen. In battle, Doug would wear Warlock as armor, in a very symbiotic fashion. Meanwhile, the X-Men defeated Magus after his landing. He fled and would not be seen for some time, until the “Mutant Massacre” story arc . The New Mutants attended a concert by rock star Lila Cheney. She secretly was an interstellar thief and a mutant teleporter with intergalactic range. She involved the New Mutants in an intergalactic scheme to steal the Earth. They helped her against her villainous contractor, and Sam Guthrie started an improbable romantic relationship with the rock star. Although Bobby and Rahne had seemed cured after their first encounter with Cloak and Dagger, their link resurfaced. Sunspot and Wolfsbane went through a seemingly mystical ordeal where Cloak and Dagger’s powers were transferred to them. Xavier, the X-Man Rogue, and Magik were able to cure them and restore the powers back to their original hosts after Tyrone and Tandy reluctantly agreed to take their powers back. Some months later, Rahne, Dani, Doug and Warlock went with Xavier to Muir Island to help Moira MacTaggert with David Haller. He was the son of Xavier and his former lover, Gabrielle Haller. Xavier didn’t know he was the father. Unsurprisingly, the teenager had powerful psychic abilities. As a child, to save his own life, he killed several terrorists with a mind blast. The trauma made him first catatonic, then autistic, but manifesting multiple powers and personalities. He was Legion. Legion detonated Moira’s medical bay and trapped Tom Corsi and Sharon Friedlander in a coma. Legion had pulled their minds out of their bodies and trapped them within his own damaged psyche. Soon, Rahne and Moira joined them in a coma. Xavier used his own power to reach for David’s mind. But recent injuries left Xavier weakened, and Legion overpowered him. He, along with Dani, Doug and Warlock were swallowed into David’s mind as well. It was a battlefield where three distinct personalities competed for the control of David’s mind and body. Xavier and his students managed to broker a truce between the split personalities and free the trapped souls. Meanwhile, at the mansion, Roberto and Amara were abducted. 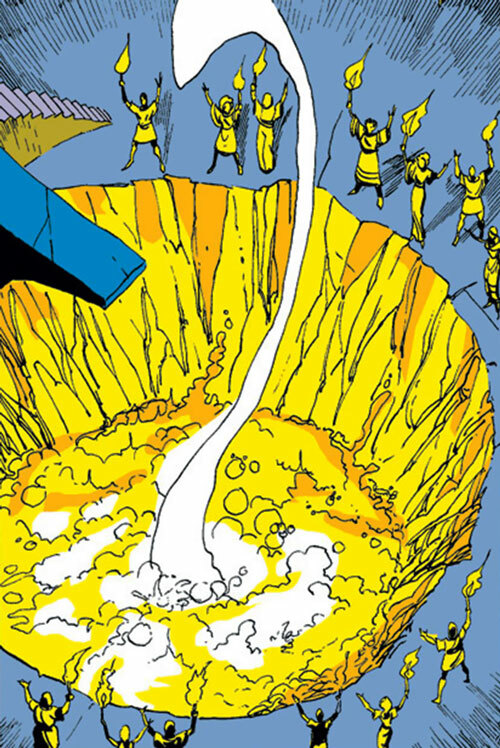 Sam and Illyana pursued them to Los Angeles and found that Sunspot and Magma had been forced to join the Gladiators. This was a group of mutant misfits who fought in illegal, bloody, often fatal battles to entertain the wealthy of Los Angeles. Roberto and Amara were told that abducted children were being held hostage and would be killed if they did not fight. Sam’s girlfriend Lila Cheney had a home in Los Angeles, so Sam and Illyana went to her for help. Dazzler was working for Lila at the time, and had previously been involved with the Gladiators. Lila and Dazzler both got involved in helping the New Mutants. This was at the beginning of Secret Wars II, when the Beyonder was on Earth in human form. Xavier detected his coming but was weakened by his injuries. He was not able to help but tried to spread the alarm, managing to contact Magneto and Captain America. 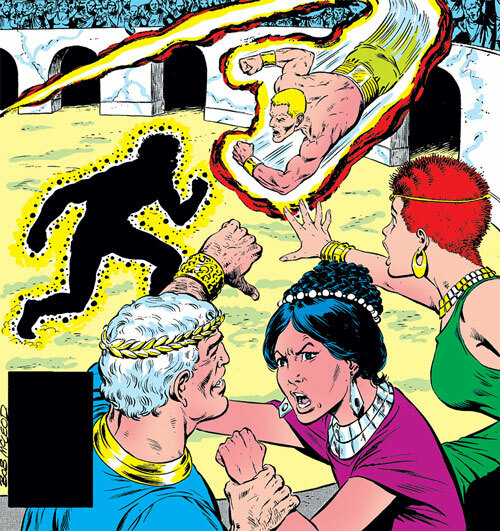 Magneto came to the Gladiators’ arena and summoned the New Mutants to join him, Captain America (Steve Rogers), and the X-Men in battling the Beyonder. Roberto and Amara stayed behind because of the hostages. 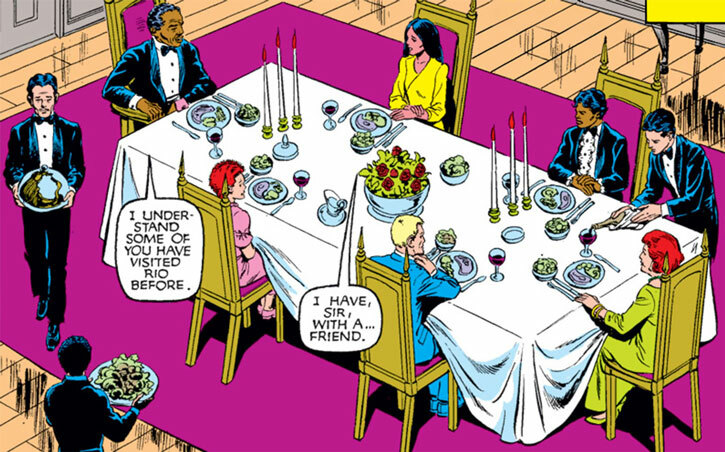 During the confrontation with the Beyonder, most of the X-Men, along with Magneto and Lila, got separated from Magik, Cannonball, Dazzler, Rachel Summers, and Kitty Pryde. Unable to find the Beyonder, Kitty and Rachel stayed in L.A. to help the New Mutants against the Gladiators. The arena was now run by a mysterious obese woman with mental powers. Surprise! The mysterious woman was Karma. She had survived Viper’s explosion but had been possessed by Amahl Farouk, who would eventually be called the Shadow King. When things went wrong for Farouk, he used all the possessed people as hostages to keep him safe while he made his escape. The complete New Mutants team pursued, asking Kitty and Rachel to stay behind. They still didn’t know about Farouk but felt that Karma was their responsibility. They started a wild chase around the world to get their friend Karma back, pursuing to Madripoor and then to Cairo, Egypt. In Cairo, they met Storm (depowered and roaming in Africa). Storm knew the truth about Farouk, and with a bit of time travel, Magik got the explanation behind Karma’s possession. With Storm’s aid, the New Mutants helped Karma vanquish Farouk in an astral duel. After defeating Farouk, Storm took the New Mutants to recover on the Aegean island of Kirinos. Many of the New Mutants were hurting emotionally after their traumatic experiences. Karma in particular felt violated, and detested her physical state. Farouk’s taste for all sorts of excess had made her body into an unmovable mountain of flesh. Then Storm and the New Mutants were abruptly abducted to Asgard . Odin was missing, Thor had invaded Hela’s domain, and Loki was plotting to find a surrogate thunder god he could control in a scheme to increase his popularity and win the throne. Knowing Ororo was now deprived of her mastery of the elements, Loki decided restoring her powers might help his scheming. As Loki had previously sworn not to harm the X-Men ever again, he tasked Amora, the Enchantress, with bringing the depowered mutant to him and with repaying the X-Men for their former insults. Mistaking the New Mutants for their elders, as they accompanied Storm, Amora captured everyone. Storm was brought to Loki, who immediately began trying to win her friendship. When The Enchantress was about to dispose of the New Mutants, Illyana teleported them away. Amora’s spells made the stepping disc malfunction. All the New Mutants emerged in different parts of Asgard, except Illyana who was left in the dungeon. Each of the New Mutants would somehow have to find their way on their own. During their ordeals, they made both friends and enemies. The most significant experience was for Danielle Moonstar. She helped a beautiful winged stallion avoid capture by Hela’s minions. The horse, Brightwind, was the mount of a fallen Valkyrie, servants of Odin, Choosers of the Slain. The Valkyries recognized Dani had been chosen by Brightwind as one of their own. As such, she gained the power to predict the imminent death of anyone, and, to a limited extent, to try to delay its coming. And she kept the flying horse. Karma, teleported to a desert and several months into the past, was tempted to give up. But she fought to survive so that she could help a lost child. Over several months of privation and hardship, she lost her extra weight and returned to her fighting trim. The Enchantress extracted Illyana’s demonic personality, gave it physical form, and launched it to collect the scattered New Mutants. Between Darkchylde’s work and each mutant’s wanderings, the whole crew was reunited and defeated the Enchantress. Illyana sent her to Limbo for S’ym to deal with appropriately. Now the New Mutants wanted payback from Loki. Meanwhile, through the link Kitty Pryde shares with Illyana (and with subtle help from Karnilla the Nornqueen), the X-Men discovered the abduction of Storm and the New Mutants. They came to the rescue. To restore Storm’s powers, Loki planned to give her a new thunder hammer enchanted by him to resemble Thor’s Mjolnir or Beta Ray Bill’s Stormbreaker. But he also enchanted it so that he would control Ororo through the power of the hammer. Loki coerced Eitri, the Dwarf Lord, into forging the hammer. To complete the hammer, the Dwarf Lord asked for the participation of Magma (transformed against her will into a cute little faerie in Asgard) and Cannonball. Under the direction of Eitri, Amara used her heat and molten rock control, while Sam lifted her all around the ironworks. The two were then sent to deliver the hammer to Loki. Magma was charged to keep the new hammer molten, so that Loki could work his spells into it and complete it. The New Mutants planned to use the gift as a Trojan horse and turn Loki’s trick around to get to him. Sam and Amara were joined by the arriving X-Men. They split into several teams to find the others and to reach the ceremonial hall where Loki would hold the enthronement of Storm. Storm received the magical hammer. She was thrilled to be repowered, and grateful towards Loki. Through several rounds of fighting, captures, escapes, evasions, and great suffering from Wolverine, Storm recovered her spirit and realized Loki was using her. She attacked him and destroyed his gift. A bit of arm-bending from Shadowcat convinced Loki he’d better set the X-Men and the New Mutants free. As usual, his offer to help them combined trickery and malice. Either they all stay in Asgard and enjoy all they gained: powers, friends, position; or they all go back to Midgard to suffer the prejudice and misery of mutants. They chose the second option. Odin’s law about the Valkyries granted Dani the right to keep Brightwind and the death-related vision power. She changed her codename to Mirage. Going back to Earth, the X-Men and New Mutants emerged in Paris, France. Magneto, then in the Freedom Force’s custody, was being tried by an international law court. The trial was interrupted by the attack of the Fenris Twins. Xavier suffered a severe heart attack. In deep space, Lilandra felt her lover’s pain. With the help of the Starjammers, she managed an emergency evacuation so that the Starjammers’ advanced medical technology could save him. But the Starjammers were fugitives from Deathbird’s Shi’ar Empire. They had to flee while Xavier was still being treated. They were not able to return Xavier to Earth. Before leaving, Professor X, with a renewed trust in Magneto, left the care of his students and his dream to his repentant former friend. The new headmaster would have a hard time proving himself worthy of the X-Men’s and the New Mutants’ trust. He wasn’t even sure he believed in Xavier’s dream of peace between mutants and humans. 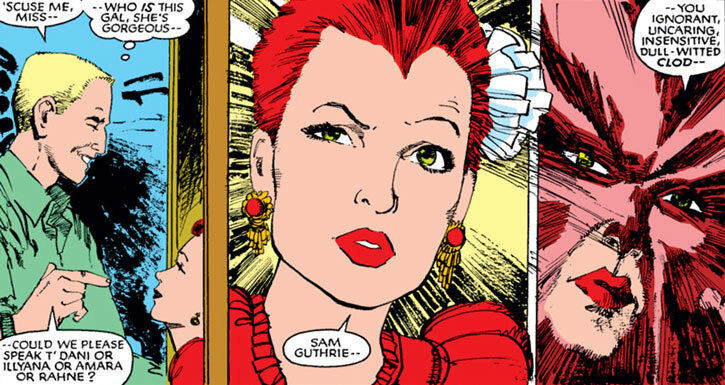 This article is continued in The New Mutants – The rest of the 1980s ! Source of Character: Marvel Universe (primarily New Mutants and X-Men comics up to The New Mutants – Special Edition in November 1985). Helper(s): Marvel Wiki, Darci, Pufnstuff, Sébastien Andrivet, Chris Cottingham. Writeup completed on the 2nd of January, 2016.